Your yard is one of the first things that people notice when they come to your home. Having a landscaped and nicely manicured yard makes your home look beautiful, and shows that you care for your home and surroundings. A beautiful yard will help the curb appeal of your home, and really impress people with that “wow” factor. Landscaping can be expensive, and you need to keep track of the expenses that are related to your yard. The Landscaping Budget Template will help you track your spending and keep an accurate log of the expenses related to your landscaping project. You will be able to estimate the cost of your landscaping project, and then see how the actual costs compare to your estimates. When planning a new landscaping project, you can use the Landscaping Budget Template for free right from our website. 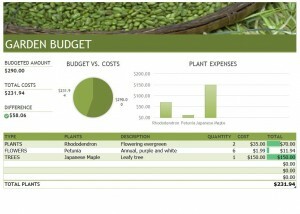 The template is easy to use and will quickly get you budgeting and planning your landscaping project. You can download the template directly to your computer, making it even easier for you to use and customize. Once you have downloaded the template, you will be able to customize the template to your exact landscaping plan needs. Make educated guesses on what you believe the costs of your landscaping project will be. As you purchase items and continue through your landscaping project, enter in the amount that you are actually spending, to compare actual cost with estimate and budgets costs for each item. You will be able to see if you are on budget, under budget, or over budget as you continue your landscaping project, and can alter your plan according to your actual cost and budget needs. When planning a new landscaping project, the Landscaping Budget Template is exactly what you need to keep yourself within a budget. You will be able to create a budget and estimate what each part of the project will cost. You will them be able to track your expenses, and keep on budget, making adjustments as needed when you are under, over, or right one budget.